If you’re familiar with any form of Christianity the term Holy Ghost or Holy Spirit is probably familiar to you. But what is the Holy Ghost? Who is the Holy Ghost? And what is His role in God’s plan? The Church of Jesus Christ of Latter-day Saints (often inadvertently referred to as the Mormon church) teaches that the Holy Ghost is a member of the Godhead, alongside God the Father and Jesus Christ. His role is incredibly important in God’s plan, because He is the means whereby we feel the love, guidance, and assurance of Heavenly Father. He can do this because He doesn’t have a body and can dwell in our hearts. Unlike most Protestant faiths, The Church of Jesus Christ believes the Godhead to be composed of three separate and distinct individuals: Heavenly Father, Jesus Christ, and the Holy Ghost. The Church of Jesus Christ does not believe in the Holy Trinity, the belief that God the Father, Jesus Christ, and the Holy Spirit are all one entity. Another key characteristic of The Church of Jesus Christ is that they believe that God the Father and Jesus Christ have perfect, resurrected bodies of flesh and bone. Many Protestant denominations believe God to be a personage of spirit, who can comprise the universe and simultaneously dwell in your heart. Mormons do believe that God is omniscient and everlasting and that because of the Holy Ghost, you can always feel close to Him. The belief that God and His Son both possess bodies like ours is unique to the Mormon faith. The Holy Ghost on the other hand does not possess His own body. This is so that He may dwell in our hearts, witnessing to us of the power, glory, and redemption of our Redeemer. The Holy Ghost (sometimes also referred to as the Holy Spirit) can appear in the form of a man. He can also appear in other forms, as when He descended as a dove on Jesus after Jesus was baptized. Sometimes scriptures refer to the Godhead as though it were one person. As I stated earlier, The Church of Jesus Christ does not believe in the Holy Trinity, but rather subscribes to theology that teaches that the members of the Godhead–Heavenly Father, Jesus Christ, and the Holy Spirit–are separate individuals. The reason they are sometimes spoken of as though they were one person is that they are all one in purpose. Each of them knows all truth and is united in God’s intents and purposes. The Holy Ghost’s purpose is to testify of God the Father and His Son. The Holy Ghost carries with Him power, authority, and gifts. The Holy Ghost was first officially introduced when Christ was preparing His disciples for His crucifixion. He said that “the Spirit of truth is come, he will guide you into all truth: for he shall not speak of himself: but whatsoever he shall hear, that shall he speak: and he will shew you things to come” (John 16:13 – 14). Aside from the Holy Spirit’s most important purpose–to witness of Heavenly Father and the Savior and truth–He has other roles. He is the bearer of comfort and peace. He is a tool for safety, able to protect us from both physical and spiritual harm. He can guide us to light and truth and open our hearts to receive of Christ’s fulness. All of these things are done in the name of Jesus Christ and as a witness of Him. Because He has no body, the Holy Ghost is capable of dwelling in our hearts, testifying of Jesus Christ. 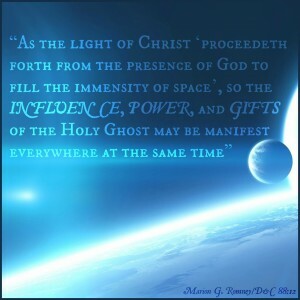 Elder Marion G. Romney, a late member of the Quorum of the Twelve Apostles, said this about the Holy Ghost: “As the light of Christ ‘proceedeth forth from the presence of God to fill the immensity of space’ (Doctrine and Covenants 88:12), so the influence, power, and gifts of the Holy Ghost may be manifest everywhere at the same time” (“The Holy Ghost”). The Holy Spirit can dwell in our hearts thanks to the power of God, or the priesthood. The Holy Ghost can affect and influence everyone, regardless of creed. Without the Holy Ghost, no one would feel that confirmation of the truth. Elder Romney also said, “Every person who knows or has ever known that Jesus is the Christ has received that witness from the Holy Ghost.” When people are baptized into The Church of Jesus Christ, they are blessed with the gift of the Holy Ghost, which entitles them to His constant companionship if they remain worthy. The Holy Ghost is an extension of God and His Son. This is so important, because the Holy Ghost is the conduit through which we feel of God’s love, guidance, comfort, and will. We need the Holy Ghost to successfully and fully live the commandments, and we need Him to help guide us back to our Father and our Savior. The Holy Ghost is a great blessing for God’s children. The Holy Spirit is one in purpose and intent with God and provides a crucial pathway between us and the Father. Without the Holy Ghost returning to Heavenly Father would be much more difficult, because while Christ certainly suffered for our sins, we would not have that spiritual connection we need to repent and live worthily. Seek out the presence of the Holy Ghost in your life and use Him to come closer to God. I know that if you do this, you will be blessed and led to the fulness of truth.